Don’t forget! This Thursday and Friday, 11:00 a.m. to 2:00 p.m., students, staff, and faculty are invited to donate unused items to the USM Free Store on the Gorham Campus. Accepted donation items include: clothing, hangers, decorations, costumes, school supplies, books, games, kitchenware, and more. 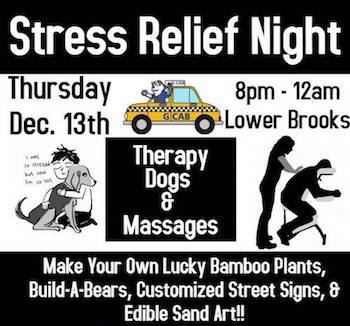 Student Activities is here for you this week with options for everyone to enjoy at their Stress Relief Night! Therapy dogs, free massages, and arcade machines will be available to help you relax along with pizza, nachos, chocolate fountains and lots more in Lower Brooks, on the Gorham Campus. On Friday evening go get an inside look at the USM Art Department and see student work at their Open Studios, 4:00 p.m. to 7:00 p.m., in Robie-Andrews on the Gorham Campus. 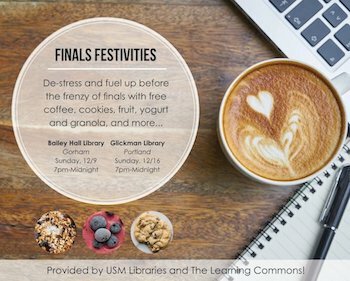 Power-up your brain for the last stretch of the semester Sunday evening, 7:00 p.m. to 11:50 p.m., at Finals Festivities! Free coffee, cookies, yogurt, granola and fruit will be yours at Glickman Library. On Monday, 10:00 a.m. to 2:00 p.m., a Textbook Buyback table will be staffed in the lower level of the Brooks Student Center, on the Gorham Campus. On Tuesday at LAC you can also sell back books at their Textbook Buyback & Clothing Sale, 10:00 AM to 2:00 PM, in the lobby. You can also sell your books back online December 10-28 through eCampus. Tuesday evening, 5:30 p.m., is the last class of free Yoga for Addiction Support this semester a the ROCC, top floor of Sullivan Gym. On Thursday, go see "Mid Winter's Eve At Stonehenge," at 7:00 p.m., the most popular of all the live presentations at the Southworth Planetarium. 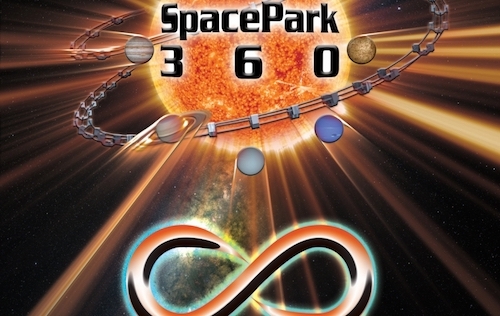 “Season of Light” is still playing if you haven’t seen it, and save the date for New Year's Planetarium 2019!